d*s reader amber blakesley turned in this great project for the d*s diy contest. though it didn’t fake the final round, i thought it was way too beautiful to go un-celebrated. 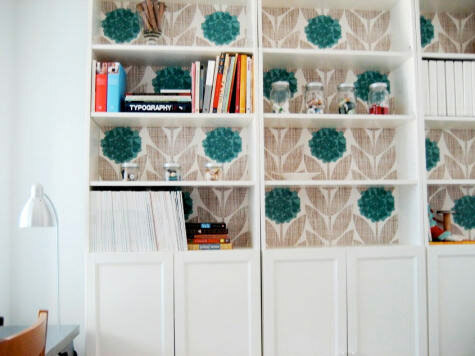 using simple tools, orla kiely wallpaper and a variety of ikea billy bookcase components, amber created these gorgeous bookshelves designed to hold books, objects and amber’s new sewing machine. i love that she thought to add billy doors to the bottom of the shelves, as a way to hide the things she didn’t want to see every day. amber was kind enough to include full instructions with her submissions so i’ve included them below. thanks to amber for her wonderful projects and congrats on a beautiful finished project. 3 billy bookcases $59 ea. 6 billy byom doors $35 ea. 3. Wallpaper the flat back pieces of the bookcases that are included. Making sure to match up the pattern across all three units. The backs that Ikea gives you are cardboard, not real wood. I would suggest you have real pressed wood cut to fit the backs of the bookshelves. I was already knee deep in constructing bookshelves when I found this out, so I went ahead and used the cardboard backs and it all worked out just fine. did you hear that Dooce dedicated her bloggie for site design to yo! love it! the shelves look gorgeous, I want to do it! My mind is reeling with possibilities now! I love love love this!! 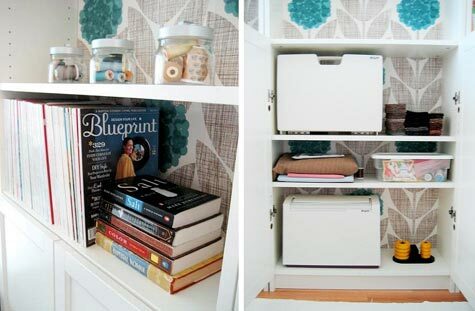 i love this, i’ve been looking for a hutch like this for my room, but i already have a billy bookcase!!! i cant wait to attempt this. This is beautiful! Thanks for sharing. A really wonderful idea. I like the wallpaper and billy door ideas! Awesome work!!! i’m doing this in our dining room. love the pop of teal! Great job! Doesn’t hurt that that wallpaper is fantastic! Amber, of course this is you! Wow, looks gorgeous! I’d expect nothing less from such a great designer as yourself. Fabulous work! I’m inspired to try something like this on my own bookcases…. i also got my wallpaper at Anthropologie, though it wasn’t one of the Orla Kiely prints– i used the Dottswold in my kitchen and i LOVE IT! Really, too cute. Great idea. Ooh! Lovely! I have dreamed of white wooden bookshelves – built in – for years. May never be able to afford them, but this shows I can get a similar look for less! I love this–I’ve been thinking about whether I could retroactively do this to the 15′ wall of Billy bookcases in our dining room, and this certainly does make me think harder about it. But what a pain to do it now that they’re finished and in place and filled. Agh. I have a question about those cardboard backs. On my old Billy the back was in two solid sheets, one for the bottom half and one for the top. For the new ones we bought, the backings were the full length but were tri-folded. Now that they’re in place you can still see where the folds were, and it makes them look way cheaper (argh). Does anyone know what I’m talking about? I have tried to fill the shelves efficiently enough to cover the backing but there are some shelves where I just can’t. Wish this one had made it to the DIY contest! The projects that made it are fabulous, but this is my favorite. Thanks for a terrific idea–they’re beautiful, Amber! One question about the wallpaper, though–were the bookshelves narrow enough for one roll width of paper, or did you need to add a little extra paper on the sides? Thanks! Did you have any problems sliding the wallpapered back into the groove?